Our ball crawls are round with inflated sides for cushioning. They hold 6-8 youngsters. Colors are cheerful and vivid. 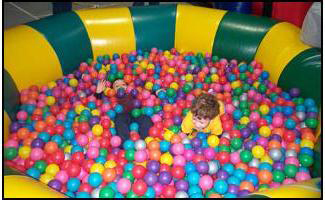 The “pool” is filled with approximately 3200 colorful balls. These are great entertainment for up to 100 children hourly.